New York Celebrates International Women’s Day | Fight Back! 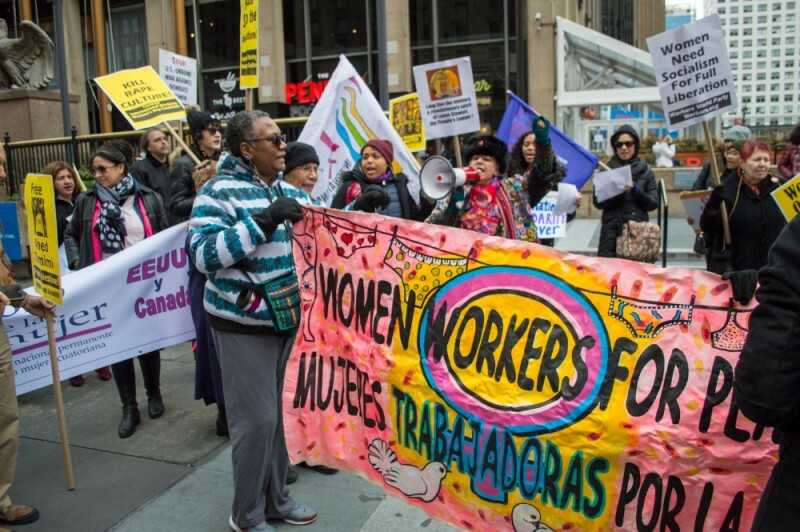 New York, NY – On March 10 approximately 60 people gathered on the corner at the entrance to Penn Station for an International Working Women’s Day rally. The rally began with Monica Moorehead, a coordinator of the IWWDC, presenting an overview and history. The rally continued with everyone loudly chanting, “When women are under attack. What do we do? Stand up! Fight Back!” This was repeated in Spanish and Tagalog. After the rally, the crowd marched through Penn Station, chanting and waving signs in support of women’s struggles. While marching through the station, protesters handed leaflets to fast food workers in support of their right to organize to improve their conditions and fight for a livable wage. From Penn Station, the group marched over to Visions, a community hall, for a discussion on women’s issues and cultural performances. People discussed imperialism and the #MeToo movement. There were speakers from movements supporting Palestine, Honduras, the Philippines, Haiti, laundry workers, women with disabilities, as well as women experiencing homelessness. The common theme amongst the speakers was the need for an entirely new system to put an end to patriarchy, the rule of men over women. Speakers called for expanding the face of the #MeToo movement to include the working class, oppressed peoples, and LGBTQIA+ women/gender non-conforming people who are at greater risk of sexual violence. To end the night, organizers showed a video commemorating women of various movements. They called on everyone in the room to join an organization to continue the fight for women’s liberation. The International Working Women’s Day Coalition (IWWDC) is composed of many groups. It includes Gabriela New York, International Action Center, and the Committee to Stop FBI Repression NY. Every year the coalition puts together a day of action for women’s liberation, immediately demanding equality for women and an end to oppression.